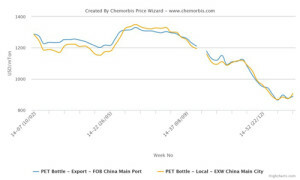 In Asia, PET prices firmed up during this past week as offer levels gained support from higher production costs, which were lifted up by firmer crude oil prices as per ChemOrbis. Over this past week, crude oil prices gained over $2/bbl and prompted the increases seen in the upstream markets. However, the trend on crude prices has not settled and the volatility of the prices causes players to question the sustainability of the increases. In the upstream PET production costs, PTA and MEG prices are still below the levels reported in early January. However, prices gained $15/ton for PTA, $55/ton for MEG and $75/ton for PX on a week over week basis. Export PET prices out of China, which were declining since the beginning of July 2014, recorded $10-20/ton increases during this past week. Offers given on FOB South Korea basis retained the previous week’s levels. Inside China, local PET offers gained CNY100-300/ton ($16-48/ton) increases on the week. Meanwhile, players operating in Turkey also reported receiving higher prices for Chinese cargoes, albeit in limited numbers. 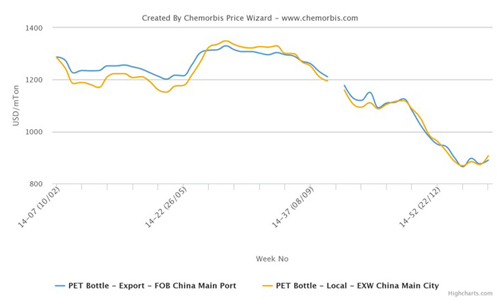 According to players’ reports, Chinese cargoes increased by up to $50/ton on CFR Turkey basis. Although PET prices have seen some increases lately, the approaching Chinese New Year holiday that will start on February 18 might slow the pace of this firming trend if not cause a reversal, according to ChemOrbis. “Upstream costs were lifted by crude oil prices, but the sustainability of the trend in oil prices remains a question mark in the market. Plus, the Chinese New Year is approaching and players will be away from their desks for about two weeks. If we are to see some real pick-up in demand, it should start by around mid-March. Until then, buyers might continue to push for lower prices,” remarked another Chinese trader.